Dallas A. Saunders studio in Geyserville. Chuck Close. 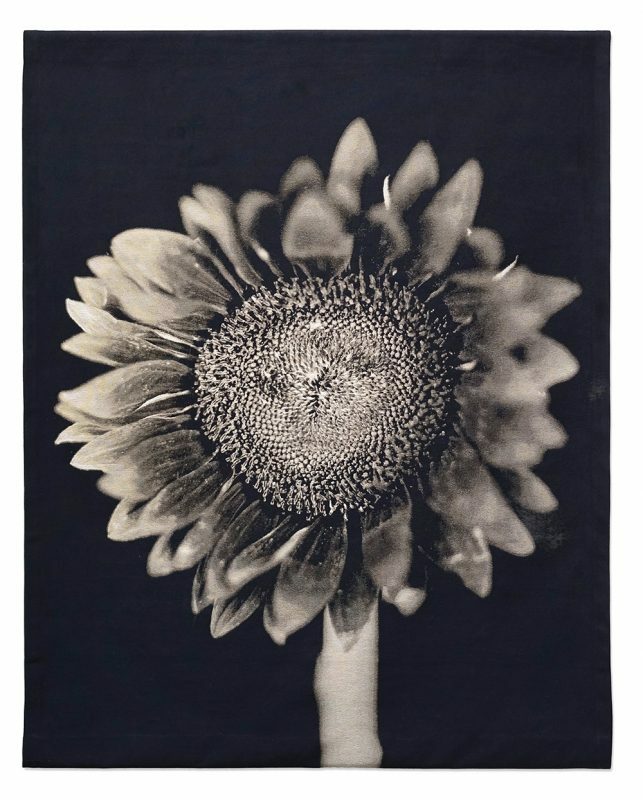 “Sunflower.” Jacquard tapestry. 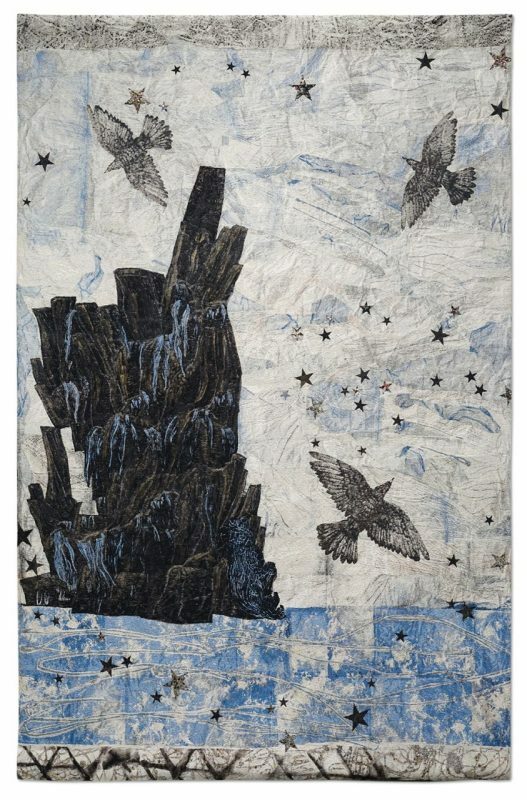 Kiki Smith. “Harbor.” Jacquard tapestry. “Morgan Seashell” design, custom printed on Belgian linen. Thea Shrack. “Autumn Leaves” design, custom printed on Belgian linen with black leather piping. Dallas A. Saunders design pillows. Leather-trimmed throw at Dallas A. Saunders studio in Geyserville. Dallas A. Saunders Artisan Textiles, 275 Highway 128, Suite 101, Geyserville, CA. Geyserville, located in the Alexander Valley of Sonoma County, has a main street and a handful of businesses (not a gas station among them). Although surrounded by the hustle and bustle of Wine Country commerce, there’s not a lot going on in this quaint tiny town. But, just off main street, there’s a concrete and glass building, two stories high, that houses the studio of textiles designer Dallas A. Saunders. The modern building stands in stark contrast to the leafy vines that surround it in early summer, creating an interesting showcase for the natural fiber pillows, blankets, and bedding Saunders displays and sells to designers and the public. 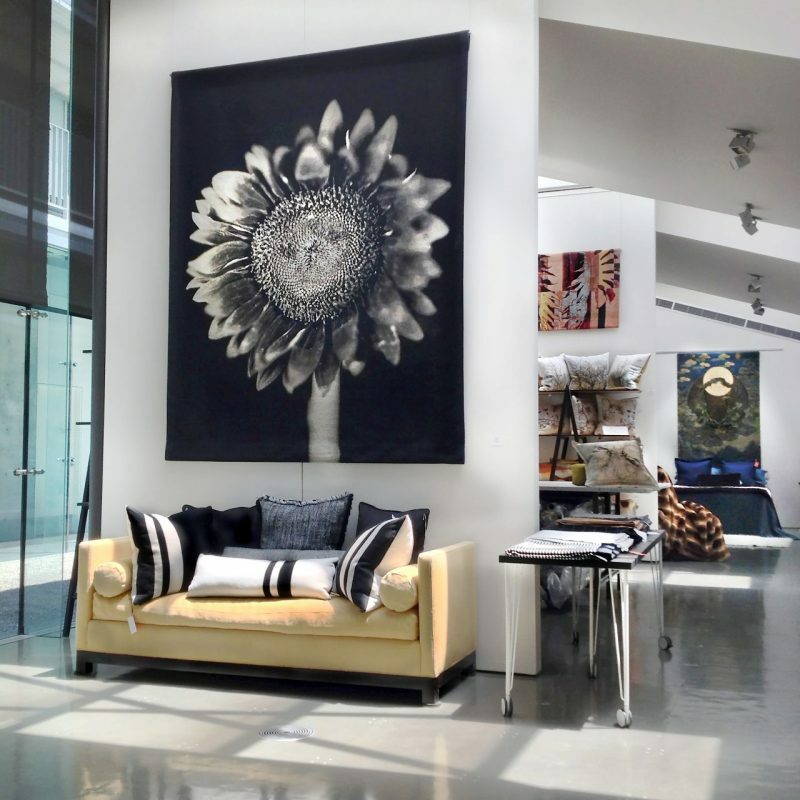 Recently, Saunders added a rotating collection of one-of-a-kind fine art tapestries, featuring the works of renowned artists, including photorealist artist Chuck Close, who has exhibited his installations at museums of modern art in New York, San Francisco, and around the world. 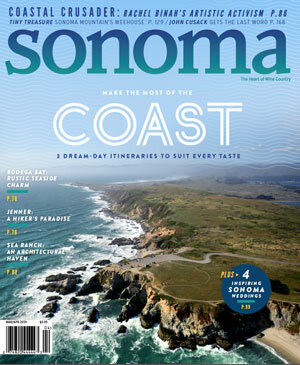 Saunders moved her business to Geyserville one year ago, in hopes that she’d attract “a few people wandering down the beautiful driveway.” Saunders says her location helps her connect with designers who frequent Geyserville on their weekend wine-tasting trips. Saunders’ inclusion of tapestries came from her familiarity with Magnolia Editions in Oakland, a fine art print studio. The studios were inspired to help create technology for large scale tapestries after artist John Nava was commissioned to do artwork for the Cathedral of Lady of the Angels in Los Angeles when it was built in 1999. The church had initially envisioned etchings for the walls, but plans were switched to tapestries, due to a problem with acoustics. The challenge was in how to put large-scale artwork on tapestries to be hung on the contemporary church’s massive walls. Thus a collaboration was put into action: a blend of Magnolia’s computerized large-scale printmaking and traditional Jacquard tapestry weaving techniques by artisans in Belgium. A series of other artists later participated in this new medium, putting their detailed artwork into intricately woven replicas involving hundreds of colored strings. Among them are April Gornik, Gus Heinze, Ed Moses and Kiki Smith, whose works are currently hanging in Saunders’ studio. 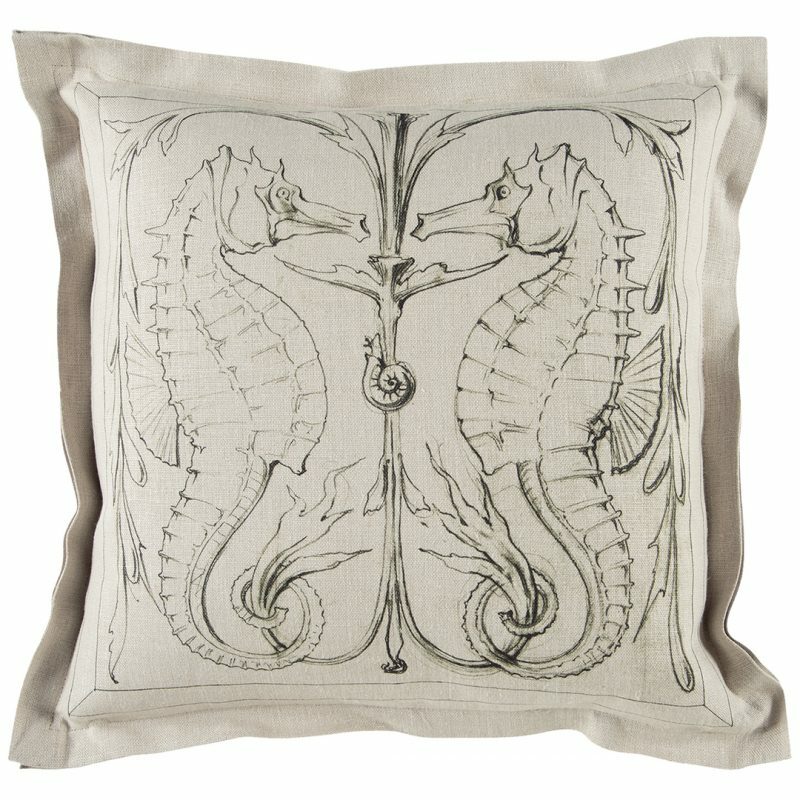 In addition to the spectacular fine art pieces are samples of Saunders’ own work: printed Belgian linen pillow covers produced in collaboration with various artists, and prints of reinterpreted designs by Julia Morgan and 16th century watercolors from the Huntington Library. 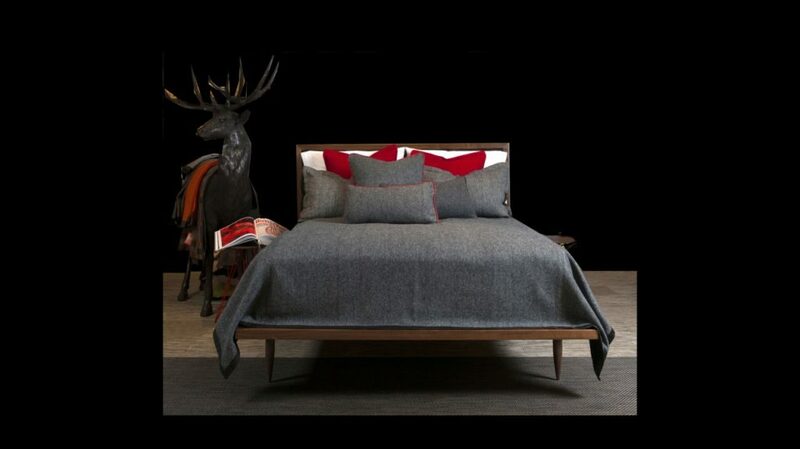 Saunders’ studio also showcases finely woven tweeds and wools, available in exquisite leather trimmed throws and bedspreads that are cleverly designed by Saunders to achieve an optimal draped fit. The current rotation of must-see tapestries will remain on exhibit until August 20. These original fine art tapestries are for sale – be sure to bring your friends with 18-foot walls. 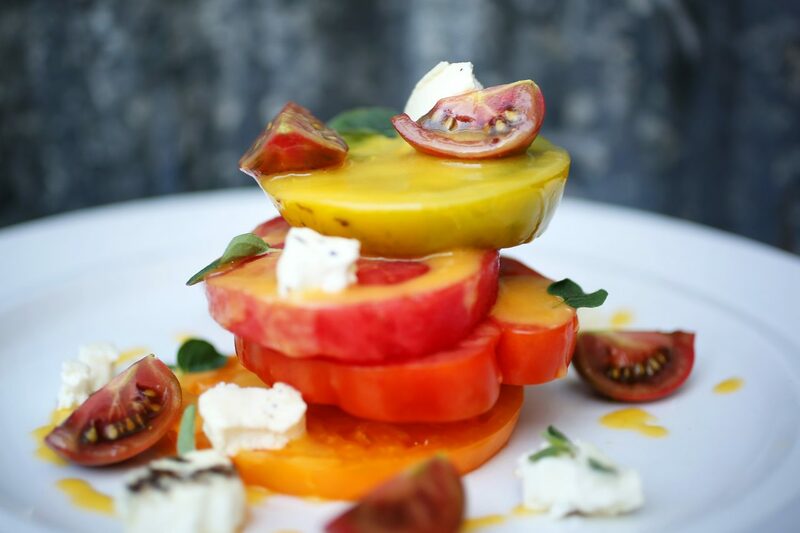 Add a fine art gallery to the list of few, but extraordinary, things Geyserville has to offer. Who needs a gas station?